Do you have a leak under a concrete floor…. or suspect one? Most residential and many commercial buildings in the greater Phoenix metro use a concrete slab on grade (roughly level with the ground) foundation, and water pipes as well as drain, and sewer pipes are often run underneath. If any of that leak it’s called a slab leak. It may be tempting to ignore the problem, but you’re likely to suffer from water stains and mold. And given time they can cause serious structural damage. So a prompt slab leak repair is important. Our slab leak detection and repair experts keep that from happening. Usually without tearing up flooring or driveways. Leaking pipes under the foundation are commonly caused by corrosion, especially in the iron water lines used prior to the 1970s. There was also a period when certain types of copper lines prone to pinholes were used. But any type of pipe can become leaky due to any sort of ground movement, improper installation, excessive water pressure, or water hammer (“banging pipes” due to sudden pressure changes). It’s never a good time for plumbing problems so we provide fast-response 24/7 emergency services as well as same-day service appointments. ASAP Plumbing provides affordable slab leak repair services to all Phoenix, Chandler, Gilbert, Arizona and surrounding areas. Schedule an appointment today. So how do you know if you have a slab leak? Here are some important clues. If you hear sounds of running water with nothing turned on, that’s an emergency! But don’t forget things like ice makers and water softeners. Cracks in floor tile, in walls, and even on the ceiling can indicate you have a water leak under your slab that’s undermined the foundation. Low water pressure may also indicate a major plumbing problem. Smaller leaks may show up as water stains, mold and mildew as well as damp, warm, or cold areas on the floor. Laminate flooring may swell or buckle. But there may also be no symptom other than a jump in usage on your monthly water bill. But there’s still progressive harm, and all leaks can suddenly worsen. When it comes to cracking through a concrete floor, guesswork simply isn’t acceptable. We can perform a sensitive pressure test to determine if there is indeed a problem then use the latest electronic slab leak detection instruments to pinpoint its location. That’s critical in keeping concrete and floor repair work to an absolute minimum. The plumbing repair itself may take only a couple of hours, but jack hammering through the foundation and repairing the concrete and flooring may span over several days. Knowing the exact location, we can advise you as to the most cost-effective and least-disruptive slab leak repair approach. Here are the three major options for residential and commercial buildings. A spot repair involves breaking through the floor then replacing just a small section of pipe. It may be the best solution if the rest of the plumbing system is in good condition. If the problem is close to the edge of the building it may be possible to reach the problem through digging alone. A re-pipe adds new plumbing through the attic or around the perimeter, bypassing the old pipes under the foundation. New piping should last a lifetime, but any problems that occur in the future will be easily accessible. Pipelining applies a cured-in-place lining inside the existing pipe and is able to permanently seal small- to mid-size leaks. 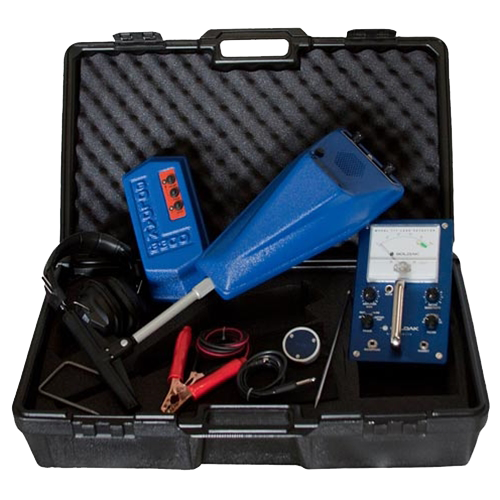 We have all the experience, training, and equipment it takes for economical slab leak detection and repair. And you’ll have our workmanship and satisfaction guarantee. Call us for same-day appointments and 24/7 emergency services.